is telling the other customer not to bother. Just do the National Trust tour, he says. Just go see John’s house and Paul’s house and forget the rest. Beside he says, the Dingle is a real shithole. to join the rest of the tourists in Liverpool. This is the moment I make my decision. You can take a tour, he says, not have to worry. Besides, it’s too hard on your own. he knows more about the Beatles than anyone. I nod, thank him for the water and leave. We find out about a transit pass. We mark up the only map we have. It is paper and vulnerable to rain. We are not mobile wireless 4G. and blisters and sore backs like explorers. It’s two miles to the first home. We tie our shoes tight. When people look at my pictures they shrug. It’s just a bunch of old houses. What did you do on vacation, they ask? I don’t get on the tour bus. And it’s not a vacation. It’s a trip. There’s a difference. I want to tell them this but I don’t. to the art that I need. They shrug and say, I guess, if you’re into that sort of thing. They ask if I went to see any West End shows. If I went on the London Eye. I hold the map. We head down Beech Street to Wavertree Road. where George was born it is raining. We keep our distance on the narrow streets. We snap just one picture before turning back the way we came. 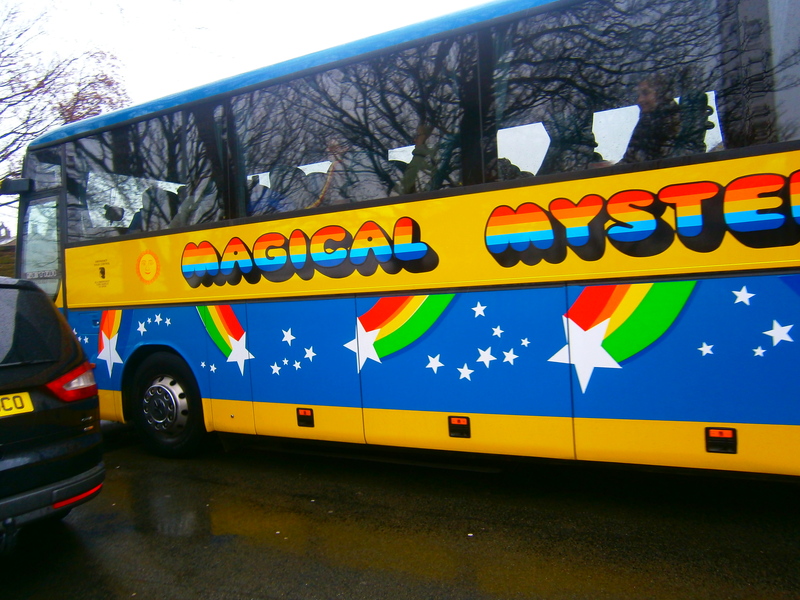 In the distance, is the Magical Mystery Tour Bus. It will never fit up those narrow streets. or talking to its people. He waves to the people in the high seats as the bus passes us. He tells me, we don’t get on buses. I nod. It is a pact that we have. I take out the map. Get me to Penny Lane, he says. to this walk. It is in honor. It is a thank you for everything we have been given. With this map in my hand, this is how I pray.